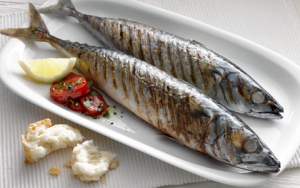 Cook the mackerel under a very hot grill or on a barbecue for about 3 minutes each side. While the fish is cooking, cut the tomatoes into slices, arrange in a bowl and sprinkle with the sugar, a little salt and pepper, olive oil and chopped herbs. Remove mackerel from the heat and serve. Lemon wedges, tomato salad and crusty bread.